How to create an email address for your domain using cpanel. Find the Mail section and click on Email Accounts. You will be on a page or screen like the following. Simply enter your desired email address at your domain. 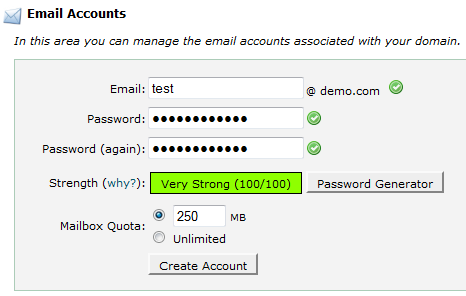 In this case, I entered test, and the complete email address for this domain will be test@demo.com. Then, you need to enter a password twice. You can choose a quota if you want, or set it to unlimited. Quota is how much you can store in the email box. 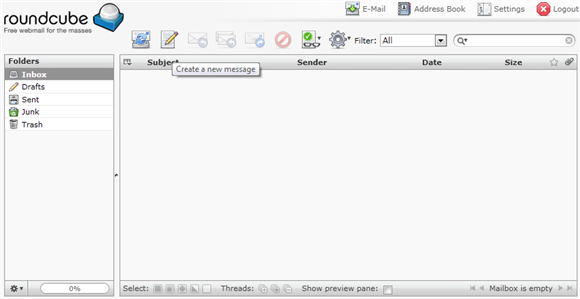 If the quota is exceeded any new mail messages would be rejected. Finally just click on the Create Account button to finish. Once you click that button that is it. You have a new email address for you domain name. You can set up and configure an email client program like Mozilla Thunderbird, Microsoft Outlook, or a variety of other 3rd party email clients to check this newly create email. Or continue on to learn how to check the newly created email using your hosting control panel (Cpanel). 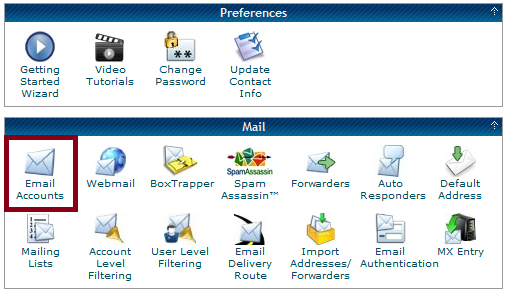 Once you have created your email you can easily check it with Cpanel. Navigate back to Email Accounts again if you are not already there. Scroll down until you see your email address. Click on More and then select Access Webmail. You will see a screen like this. Simply enter your password you created above in step 3 and click Log in. Your host may have something like Horde mail, Roundcube Mail or SquirrelMail setup. I prefer Roundcube. It is easy to navigate and use. So now all I have to do is simply click on Roundcube. And there you are logged into your newly created email box for your domain name. You can send, receive, forward, reply, create an address book, and a variety of other settings. Just like any other online webmail, but this one is more professional and specific to your domain name. After creating your own email specific to your domain name, you may want to send and receive a few test emails to yourself to verify everything is working properly. If so you may want to update your dolphin administration email addresses with your new email address. You will also want to remember to check it. You could set up forwarding or other options to automatically send it to an email box you use more often like your gmail, yahoo, hotmail, or similar so you know when you have new mail and need to go check it.